“When I grew up, this was the most important class to win.” – McLain Ward. Tampa, FL – April 11, 2013 – Two-time Olympic Gold medalist McLain Ward added his name to the record books on Saturday night at Raymond James Stadium, becoming only the third rider in the long and storied history of the American Invitational to win the event three times. Piloting his fiery chestnut Rothchild, Ward edged out fellow London Olympian Reed Kessler for the hard-fought victory. The American Invitational, now entering its fifth decade of equestrian excellence, was first held in the old Tampa Stadium in 1973. The groundbreaking class, an event with no entry fees and open to only the very best show jumpers in the world, was the creation of horse show visionary Gene Mische, who knew that the sport of show jumping deserved a bigger stage under the sport’s brightest lights. He knew that the Tampa Bay area was the right market for this new concept and he also knew that the “Big Sombrero” as the old stadium was called, was the perfect stage. From the very beginning, because of the tremendous test of skill and talent required to gain victory, the class has been hailed as the ‘Super Bowl of Show Jumping,’ and as such has always attracted the sport’s greatest stars. “This is a class we have always coveted,” Ward said. “I remember exactly where I was when I called my dad when I won it the first time.” That first victory was added to the record books back in 1998 on his mount, Twist du Valon. “I think the Invitational is important for future young riders, for my children one day I hope. I think these are the kind of classes that our country, not only the athletes and the sponsors, but also the Federation really need to rally behind,” he noted. From Rodney Jenkins, the very first winner in 1973, to Ward, this year’s champion, the roll call of winners of the American Invitational reads like a who’s who of show jumping. And that first event, forty-one years ago, set the stage for so many amazing competitions that followed. Nearly 15,000 spectators were on hand in 1973 to see the “Red Rider,” Rodney Jenkins and the amazing Idle Dice, the world’s leading money winning horse at the time, soar to victory in that first ever American Invitational. Jenkins beat an all-star field that first year, including Olympic Gold Medalists Joe Fargis, Michael Matz and Conrad Homfeld. Famed Course Designer Pamela Carruthers of Great Britain was on hand to design the tough and challenging test for the debut of this incredible event. Jenkins would have two chances that first year, as eight of the thirty-seven starters went clean in the first round. Jenkins, in addition to the spotless round on Idle Dice, qualified Balbuco for the encounter against the clock. Conrad Homfeld and John Henry, as the first pair to return, rolled a rail after attempting a careful and clear round. Jenkins and Balbuco also had a single knockdown in the jump-off, while James Hulick, competing on Willie Wonderful scored a total of twelve faults. Anthony D’ Ambrosio, Jr, riding Phoenix was next to go, but couldn’t get by that huge six foot vertical at the final fence. Jenkins then returned with the great Idle Dice. When Michael Matz was unseated when Snow Flurry stopped at that final vertical, only tiny Michelle McEvoy (Grubb) and the 17 hand tall and talented chestnut horse, Sundancer, stood between Jenkins and victory. McEvoy, just out of the Junior Jumper division, and weighing in at just 99 pounds, executed a flawless second round. Although clocking in ten seconds slower than Jenkins and Idle Dice, Sundancer and Grubb received the second standing ovation from the enthusiastic Tampa Stadium crowd that afternoon. 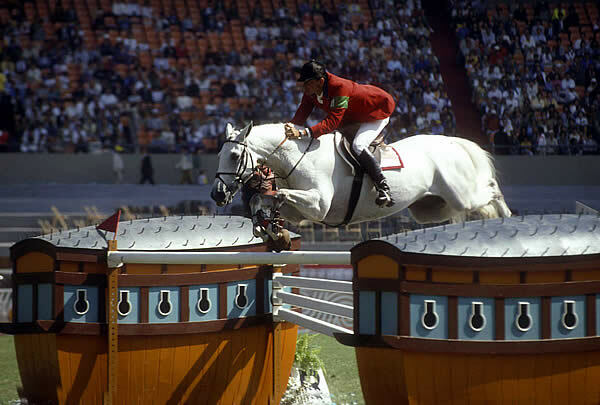 His words were prophetic, as in the years following, both at the old Tampa Stadium and now at Raymond James Stadium; the best show jumping in North America is always on display. Young Michelle McEvoy proved she was just warming up for bigger and better things to come that first year when she finished second to the legendary Jenkins and Idle Dice. She returned in 1974 and then again in 1975 with a vengeance, to post back to back wins with Sundancer. That class, in 1974, was the first show jumping event held under the lights in Tampa. McEvoy held the title as the only rider to win two years in a row for fifteen years before Molly Ashe and Kroon Gravin finally went back to back in 2001 and 2002. The next three years of action in Tampa saw a string of young riders solidify their place among the sport’s greatest stars. Terry Rudd and Mr. Demeanor won in 1977 and Olympic Individual Bronze Medalist Norman Dello Joio claimed victory in 1978 on Allegro. In 1979, Anheuser-Busch came aboard as the title sponsor of the Budweiser American Invitational. The prize money was doubled to $30,000, an incredible amount at the time. That year, Rodney Jenkins became the second two-time winner, sailing to victory aboard Third Man. In 1980, with the prize money bumped up again, this time to $35,000, it was Bernie Traurig sealing the win with Eadenvale. A year later, in 1981, with $50,000 in prize money on the line, Buddy Brown led the victory gallop on Felton. With only two women gaining victory during the first nine years of competition, in 1982, Melanie Taylor began a run of four consecutive wins and six in seven years by women riders. Taylor thrilled the Tampa Stadium crowd with a thrilling race to the finish aboard Calypso to win that year. Katie Monahan (Prudent) produced the first of her three American Invitational wins in 1983. Coming on three different horses, her first victory came on Noren. In 1984, the United States Equestrian Team designated the American Invitational as the first of five Olympic Show Jumping Trials. Additionally, the prize money was doubled to $100,000, which only increased the excitement that year. Leslie Howard emerged victorious on Albany, en route to a berth on the 1984 Los Angeles Olympic team. Monahan returned in 1985 to claim her second Invitational title, this time on The Governor. With CBS TV coverage adding to the excitement, the 1986 American Invitational was won by British Olympic Silver Medalist Tim Grubb and Linky. Grubb became the first international rider to claim Invitational glory, and as the husband of Michelle McEvoy, Tim entered the record books as part of the only husband-wife team to ever win in Tampa. American Thoroughbred, For the Moment, and rider Lisa Jacquin walked away with the 1987 American Invitational title, one of six grand prix wins that season for the dynamic duo. Katie Monahan, now married to French rider Henri Prudent claimed her third American Invitational title in 1988 aboard Special Envoy. To this day, she is one of only two riders to win this impressive and challenging class three times. Greg Best, fresh off his double Silver Medal performance at the 1988 Olympic Games, rode the incomparable Gem Twist to victory in 1989 in Tampa. In 1990, it was David Raposa and Seven Wonder taking home top honors. Seven Wonder would later become the first horse to win the American Invitational under the guidance of two different riders. In 1991, George Lindeman, Jr. and the American Quarter Horse, Threes and Sevens, led the round of honor. In 1992, the American Invitational made history again, moving indoors to the all new Florida Suncoast Dome in St. Petersburg, Florida. It was Captain Canada, Ian Millar and the famed Big Ben, claiming the top prize at the only indoor Invitational. The American Invitational returned to Tampa Stadium in 1993 and it was Debbie Stephens, wife of Course Designer Steve Stephens, emerging as the winner aboard Volan. A year later, in 1994, after twenty years of competing for the title, it was three-time U.S. Olympian Michael Matz, finally stepping to the top the podium at Tampa Stadium, after an exciting win aboard Rhum IV. Two years later, he would ride Rhum IV to Team Silver at the Olympic Games in Atlanta, Georgia. 1995 saw Chris Kappler post the first of his three American Invitational victories. Riding Seven Wonder, the horse David Raposa rode to top honors five years earlier, Kappler emerged as the winner over one of the toughest courses in class history. Harold Chopping claimed top honors in 1996 aboard Brandy and then in 1997, it was Todd Minikus and Ravel leading the victory gallop in the final American Invitational at the old Tampa Stadium. In 1998, the American Invitational moved next door to the all-new Raymond James Stadium, and it was one of America’s fastest rising equestrian stars at the time, McLain Ward, securing his first Invitational win aboard Twist du Valon. A year later, with the prize money upped to $150,000, Marley Goodman and Canyon were named the winners. Schuyler Riley opened the new decade in 2000 with a hard fought win on her long-time partner Ilian. Riley, that year, also posted wins at the American Gold Cup and AGA National Championships. In 2001, Molly Ashe and Kroon Gravin became only the second horse and rider combination in history to win the American Invitational in back to back years. Adding to the excitement of Ashe’s win that first year was the new prize money total of $200,000, making the Invitational the richest showing event in the United States at the time. In 2003, Chris Kappler won for the second time, this time aboard his 2004 Olympic Gold Medal partner, Royal Kaliber. Kappler produced the only clear round that night, and the following week the pair went on to win the $150,000 AGA National Championships in Wellington. In 2004, Norman Dello Joio led the round of honor in Tampa for the second time in his illustrious career. In a five-horse jump-off, Dello Joio and his mount Glasgow edged Beezie Madden and Authentic for the win. 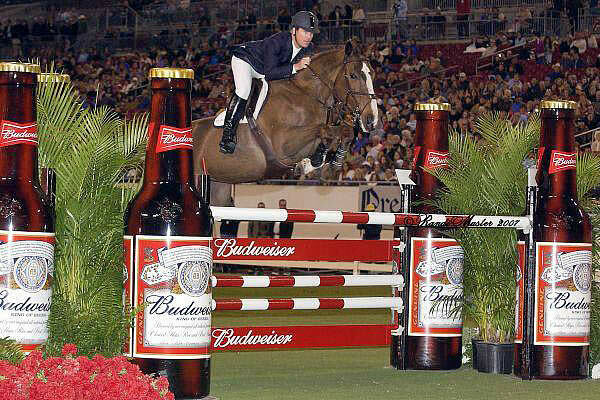 Madden and her Gold medal Olympic partner Authentic came back in 2005 to post the first of her two wins in the Tampa classic. In the only two horse jump-off in the history of the American Invitational, Madden raced past Jeffery Welles and Armani for the victory at Raymond James Stadium. In a four-horse jump-off in 2006, the reigning Olympic champion and three-time World Cup Champion, Rodrigo Pessoa of Brazil and his 17-year-old partner Baloubet du Rouet, in their first ever appearance, soared to victory over Chris Kappler and his rising star VDL Oranta. In 2007, Beezie Madden became only the seventh rider in the history of the event to win the Invitational more than once, as she and 2005 champion Authentic raced to victory over McLain Ward and Sapphire by 2/10ths of a second in one of the closest finishes in American Invitational history. Ward and Sapphire got their revenge the next year in 2008, but it didn’t come easy for the dynamic Olympic gold medal combination. After a nearly hour-long break because of inclement weather, Ward and Sapphire returned to the ring to complete their first round course that was interrupted by a severe thunderstorm. Their eventual clear trip in the first round and their one time fault score in the jump-off gave them the win over Californian Richard Spooner and Cristallo. In 2009, Chris Kappler and VDL Oranta improved on their second place finish from 2006. On a night when no one was able to go clear over the tough Steve Stephens first round course, Kappler and his gray mare raced to victory in a jump-off among the seven four faulters. One of only two clear in the tiebreaker, Kappler outgunned second place finishers Todd Minikus and Pavarotti by over three seconds for his history-making third American Invitational win. Jeffery Welles and Armani powered to victory in an emotionally charged 2010 American Invitational. It was a special night at Raymond James Stadium as the event became known officially as the Gene Mische American Invitational. G & C Farm came on board as well, as the presenting sponsor. Mische, on hand in Tampa after fighting a two-year long battle with cancer, was honored in a beautiful parade before the class. Welles and Armani finished second in 2005, but emerged on top in 2010, following a three-horse jump-off. Welles edged Peter Leone on Select by 5/10ths of a second for the win. “It was so nice to see Gene Mische here tonight. He has done so much for our sport over the years. He has given so much and it was really nice for him to be recognized tonight,” Welles reflected following his victory lap. Mische passed away later that year. In 2011, it was Kent Farrington piloting the gray warmblood Uceko to a dominating five second win over Canada’s Ian Millar and In Style. It was Farrington’s first win at the Tampa event. Mario Deslauriers and Cella claimed the Invitational title in 2012 and now McLain Ward becomes only the third rider to win this prestigious event on three different occasions. There is so much history, so many great names of the sport on the trophy and so many years of equestrian brilliance in the forty year history of this American classic. Founder Gene Mische created the ‘Super Bowl of Show Jumping’ in 1973 and his lasting legacy will always be the lasting excellence of this superb Tampa event, the American Invitational. Photo Credits: Kenneth Kraus, Parker/Russell – The Book LLC, Judith Buck, FEI, Jennifer Wood, Randi Muster.